I have some very exciting news! Firstly - for you California folks - I've got a HUGE billboard up in San Francisco right now - it's so cool, check it out if you happen to be out by the airport, hehe! Secondly - I have a brand new figurine collection from the Hamilton Collection -(Dragon Divas, on shoes...) up for pre-order now. Thirdly - in plenty of time for the holidays - I have a brand new Limited Edition Christmas Statue from the Bradford Exchange (Dear Santa....Define Good!). And then, in addition, I have new ACEO cards up tonight -all at just one penny (a lot of new ones like The Three Fates, Painting the Roses Red, Born of a Pumpkin, Red Maple Fairy and more!)! More about the Billboard, and the Project! Or simply call 1-877-268-6638 (toll-free) and tell them you'd like to reserve Jasmine Becket-Griffith's "Dear Santa: Define Good!" statue - her item number is 109494001. "Collectors will be enchanted with the eye-catching details crafted into “Fierce and Fashionable.” Ruby simply enchants with her innocent eyes, demure pose, “dragon” wings and tendrils framing her sweet face. Her gleaming platform stiletto with a peek-a-boo toe is cleverly designed with a vibrant dragon motif. Look closely to find her adorable dragon companion perched atop the shoebox display! Plus, the shoe is removable from the base, giving collectors even more display options. And both shoe and base boast a high-gloss finish and are adorned with ssparkling faux gems, adding even more mystical allure!" This run at only $29.99 per figurine, around 4" high, they are hand painted, numbered, come with a certificate of authenticity and all that good stuff! 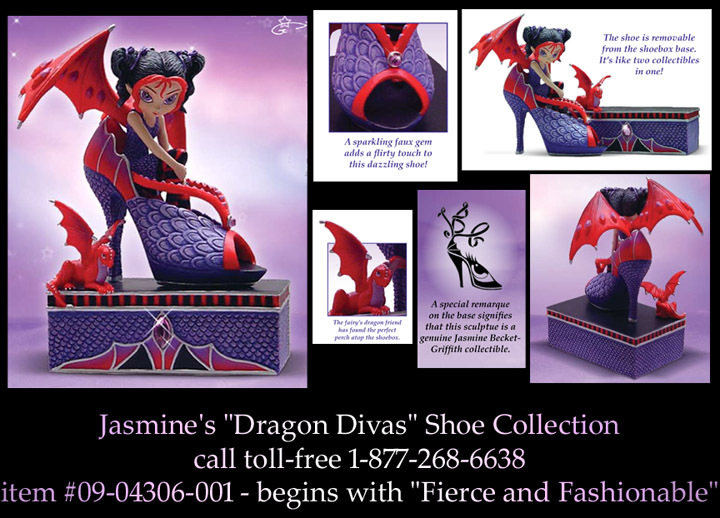 Now, as I mentioned - these are still in the sneak-preview stage so you can only order by phone - Or simply call 1-877-268-6638 (toll-free) and tell them you'd like to reserve Jasmine Becket-Griffith's "Dragon Divas " Shoe Collection - the item number is 09-04306-001. Next up! The ACEO cards! Some lovely ones for you this week - ALL AT ONE PENNY!